An Encyclopaedia of Oxford Pubs, Inns and Taverns, is the most precise collection ever published on the past and present pubs of Oxford. 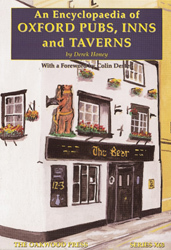 The author has researched over 700 licensed premises, from early Norman times to the present day, with full details of their individual histories, and often a history of the area or street. Starting at the Abingdon Arms, a tavern once in Market Street, and ending at Yate’s Wine Lodge in George Street, the book covers nearly 1,000 years of Oxford history. Famous pubs and inns such as the Mitre and the Bear are fully covered as are the lost and unknown ones. With a foreword written by Colin Dexter, the creator of Inspector Morse. Whether a reader is interested in history, pubs, Oxford, or all three, this book will be a valuable source of reference and enjoyment. In 1840 Oxford had 400 pubs, a high proportion of one to every 60 inhabitants. In 1880 over 200 pubs were listed in central Oxford alone. Oxford’s famous fictional policeman, Inspector Morse, created by Colin Dexter, solves many of his cases in pubs, creating a brand new enterprise with a walking Morse trail pub tour operating within the city. Many tourists now visit the city to view these pubs. Before the railway came Oxford inns and hotels were the best in the world, but by 1860 it is said they had declined so much that a guide written at the time stated they were ‘bad, dirty, comfortless and very high in charges’. Until the 1950s ‘officially’ all central pubs were out-of-bounds to undergraduates, and the Proctors accompanied by the Bulldogs (university policemen) would visit them inquiring of any intoxicated young man, ‘Are you a member of this university Sir?’ Offenders were threatened with ‘gating’ (confinement to the college), fined , or ‘sent down’ for the rest of the term. Yet at one time the university granted wine licences as well as the local council. Oxford pubs past and present vary according to their customers. Some are still varsity pubs, like the King’s Arms opposite the New Bodleian Library and owned by Wadham College next door. So remote is the Isis Inn at Iffley Lock that the beer was taken there in a special punt along the River Thames from Donnington Bridge, while the romantics punted up the Cherwell to the Victoria Arms at Marston. Tourists are led to the Turf Tavern hidden away down St Helen’s Passage and under the old city wall, and old Oxford men recall their student days in the Trout at Godstow. A5 format, 128 pages, more than 70 illustrations.